November is an obvious month for focusing on gratitude, especially in the U.S. because of Thanksgiving. However, I am planning to use this month to not only help my preschooler learn about gratitude and the importance of being thankful, but also as a way to initiate a daily practice of gratitude for the whole family -- one that will carry past the month of November. To get us into the habit, I have a special daily activity planned for us beginning November 1st (today) and running through Thanksgiving. 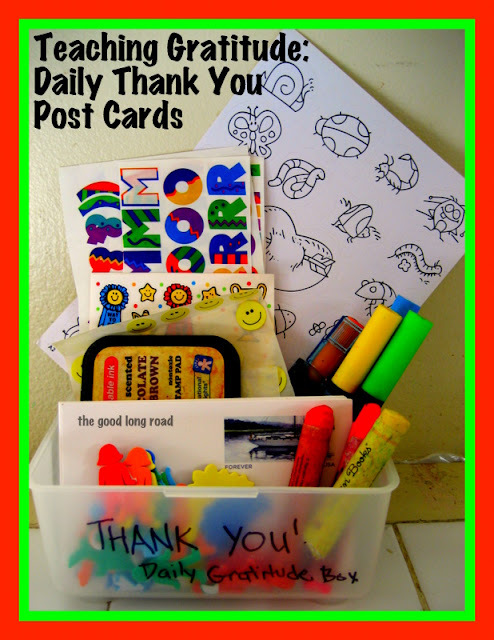 Each morning, Wild Thing and I will pick one person that he is grateful for (I may need to set out a toy, blanket, book or photo as a prompt), we will then decorate a postcard to send to that person to show our gratitude. At the post office, I got pre-stamped postcards (25 of them) for 35 cents each. A postcard stamp itself is 32 cents, so it seemed easier and more cost-effective to get the blank postcards from the post office -- plus they are perfect to decorate. I decided to do the activity in the morning instead of at night because I like the idea of starting the day with this attitude in mind -- beginning my day with a focus on being grateful. In our box: post cards, stickers, markers, crayons, letter stamps for his name and a stamp pad. I love seeing how many people are initiating this type of focus/activity in November. Awesomely Awake, recently shared 6 great tips for raising grateful children, Raising Figure Skates has a November Family Gratitude Activities post with lots of ideas and free printable word art and Inspired by Family Magazine has started a 21 Days of Gratitude Challenge for the Whole Family. We are excited to be joining the challenge and will have a special post on November 4th. Also as part of the challenge, everyday we will share something we are grateful for on Facebook, Twitter and Google Plus. Additionally, every blog post for the month of November will mention one thing I am grateful for along with whatever activity, thoughts, recipes, or musings I am sharing that day. What are you grateful for today? How do you encourage an attitude of gratitude in your family? Do you have a daily practice? A friend of mine shared that she has a date journal and every night she writes down one thing from the day that she is grateful for before going to bed. On that note, today I am grateful that somebody besides my family actually reads my blog!! 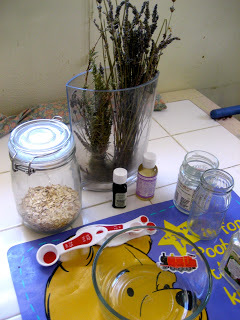 :) Happy to share at Saturday Show + Tell with Cheerios + Lattes and at Sharing Saturday at Craft Moms Share. Also shared through Link+Learn at No Time for Flash Cards and at Happy Family Times, Tip-Toe Thru Tuesday, Learning Laboratory, Tuesday Tots and as part of The Sunday Showcase! Proud to be featured by Moms Library at True Aim Education. Also featured by Toddler Approved as part of the Weekly Kids Co-Op! I love this idea, Jen. I'm horrible at thank you notes. This would be good practice for me as well as my son. Love, love, love it! I'm going to go and buy some too. I really think that even my teenagers could use this. Its so easy at their age to be consumed with themselves and their I wants and I needs that they don't stop and take a look at everything they truly have. This is a great idea- It would be a good thing to remember, especially, when times are hard- Practicing would make it more natural- I think we might have to do this with our kids- Thank you! I am so excited to read all the posts for this new series! I love your postcard idea. This is great! Being thankful and writing letters all in one activity is a great idea! I'll bet people love getting all of the nice letters too! I love this idea! My daughter spends the better part of her sister's nap time drawing. She would love to make postcards this month. And thanks for the tip about buying them from the post office! Smart! This is a beautiful idea! I think I'm going to encourage my kids to make some notes too. Thanks for sharing at AfterSchool. Such a great idea and so perfect for a preschooler. I'm going to try to do something similar with my girls. This is a great idea. Like Trisha, despite my best intentions, I am terrible about thank you notes. This will surely help! This is a lovely idea Jen. I can't wait to introduce this idea to my son. Thanks for the inspiration. What a wonderful idea!! We are doing a Thankful Tree where we add a leaf with what my daughter is thankful each day. She loves doing it, but I love this idea! Thank you so much for sharing at Sharing Saturday!! This is such a great idea!! I featured you on my site today! I included a picture, but if you don't want it included, let me know and I can remove it. We need help with being more grateful at our house so we are going to try this! I LOVE this idea!!! I suppose I'll have to pocket it for next year! But we can do a few starting this week. What a great way to show people we are grateful for them. Thank you for sharing at Happy Family Times! This is such a great idea! I bet people will love receiving the cards. Neat idea! We don't have a daily routine, but when we do cool or fun stuff, we write it down on a piece of paper and put it in the jar. We're gonna get it out on NY and read and remember all the amazing things we did all year! I love this idea. It is a great way to teach the importance of gratitude. Good for you! I have a list of gratitude books on http://mythankfuljournal.blogspot.com/2013/04/modeling-gratitude.html that are appropriate for teaching thankfulness to children. Just thot you might like to know! Love the idea of using postcards to practice showing gratitude! Thanks for sharing!